Donald Trump has called for a turnaround in the foreign policy of the United States (US). 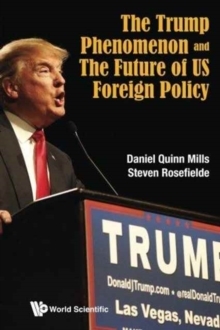 A key reason is that US foreign engagements have in recent decades proved of little benefit to the US middle and working classes.Trump's opponents have challenged him to prove that he can offer a better alternative to the foreign policy which has been pursued by the US since the Second World War.This volume shows that a sane US foreign policy that adjusts US postwar trajectory can be accomplished if leaders have the courage and integrity to do so. The principles and many details of an alternative policy based on democratic nationalism are described in this book. Democratic nationalism presumes that the US is a large family in which the needs of members of the family have a certain legitimate priority over those of people abroad.While Donald Trump has raised the level of discussion of these ideas in US public life, he does not have a monopoly on them. The shifts in the US foreign policy which are envisioned in this book can be made by any president and any political party. The shifts and the considerations which motivate them are deserving of careful attention by any US chief executive. This is not a Republican agenda, nor a Democratic one. We believe that it is a US agenda.